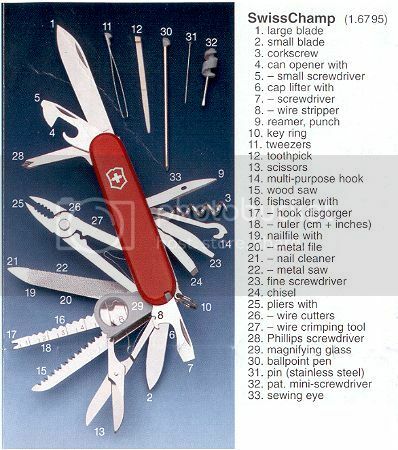 Discussion in 'Multi-tools & Multi-purpose Knives' started by JEP728, Mar 5, 2005. I have an older Vic Deluxe Tinker still in the original box. This knife does not have the "hook" on it. Does anyone know what year they started including the "hook" on the Deluxe Tinker? Thanks for your help. Does anyone know what year they started including the "hook" on the Deluxe Tinker? The multi-purpose hook was introduced in 1991. Vincent, you appear to be the SAK authority here. Can you tell me what year the Swiss Champ knife was introduced? I think it was some time during the mid-80's. Proir to the release of the Swiss Champ I believe the largest SAK knife was called the Champion which was the Swiss Champ without pliers? I can't seem to find this SAK anywhere. Has it been discontinued and if so do you know when it was last produced. 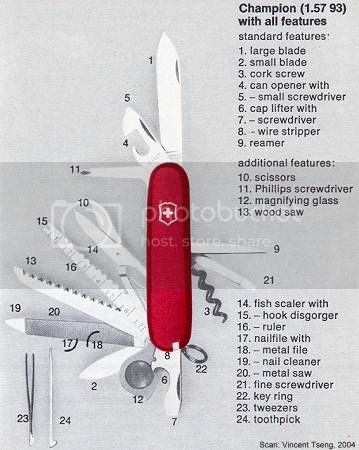 The SwissChamp came out about when the pliers were introduced - 1986. I wrote to Victorinox at the beginning of 1993 to ask about the Champion model and they said it was still being produced then - although I hadn't seen it for some time by then. The Champion Plus was available for a short while at Wal-Mart - and this was a SwissChamp without the Pliers - the "plus" designation meant it (in this case) had the ballPen, Pin in the handles as well as the mini-screwdriver in the corkscrew -"plus" the extra tools on the back of the backprings as on the SwissChamp - over the original Champion. Just as some trivia - the original Champion was the SAK in the permanent collection of MoMA - Museum of Modern Art - Architecture and Design Dept; as well as the State Museum of Fine Arts in Munich. Vincent, thanks for your reply. I picked up a Swiss Champ in 1987 when I was on holiday to replace my much abused Explorer. It does not have the hook or the pin. I got the Champion Plus last summer at Wal Mart for $15!! They only had two left and I don't know why I didn't buy them both Since I usually also carry one of my Leatherman tools (because the pliers are so much better), this was the perfect EDC SAK for me. I recently got in a trade a similiar Vic' Deluxe Tinker, without hook, but it has some oddities about it. I assume the WOH means without hook, which implies it was made after the hook was added, otherwise why need to say that it is without it? Makes sense to me. Sure, the Victorinox factory stopped making the model without the hook one day, and the next started making them with the hook, but most folks don't buy them from the factory. So for a while there, distributors and retailers still had the old model in stock, as well as the new ones from Vic. Obviously they'd expect buyers to have a preference for with-hook or without-hook; the distributors no doubt marked the old stock so that customers would know they were getting what they wanted. Once the old stock was depleted, they wouldn't need the make the distinction, so the marking was dropped.